Bruno Mars' last stop for his Doo Wops & Hooligans tour ended with a bang in Vector Arena, Auckland! This will definitely be classified under one of the best concert i've attended to. Aside from knowing the fact that this dude can REALLY sing and was recently caught for possessing cocaine, i didn't have much expectations. But after walking out of the arena tonight, i'm amazed. Well, partially cause he spent six minutes singing "Just The Way You Are" and kept repeating that i'm amazing just the way i am. The crowd was filled with enthusiasm as well despite the cold weather tonight. 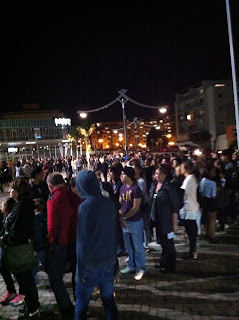 Thankfully, we didn't have to queue as long as how we had to for Adam Lambert's concert. Once we got inside the arena, we were in for a treat. We saw Bruno Mars walking around freely. Lol! This guy had people turning their heads for a second cause he did have a bit of resemblance to Bruno Mars himself on top of the outfit he chose to wear that night. But upon a closer look, my friend said he's probably a Bruno Wang or something. The opening act for Bruno's concert was Diafrix that came from Melbourne. I'm not a huge fan of hip hop music but a few of their tracks reminded me of the 90's style of hip hop which is pretty mean. Apparently they say they've performed in many different states within Australia and claimed that the crowd in Auckland are the best they've ever performed for. 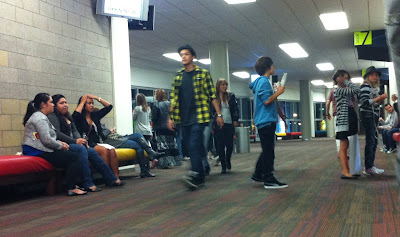 I'm sure it's a performer line to please the crowd and what not but i kinda screamed back to them "MOVE TO AUCKLAND!!!" Bruno Mars starting performing at about 9.15 pm shortly after Diafrix ended their performance. The entrance theme to him and his band coming in was over exaggerated in a funny way. He used Also Sprach Zarathustra's "Sunrise" or those who's familiar with WWE would know it as Ric Flair's entrance theme. But that definitely did the trick to make the crowd go wild. He started off the concert by showing off his drum skills (he's really good at it too!) and then belting out to the first half of "The Other Side" which he did a duet with Cee Lo Green on his album. After that part i was convinced that this is going to be another awesome concert. I still can't wrap around my head hearing him said that he used to play in bars every night just making quick buck and it's always been a dream for him to sing inside an arena. Before he ended his concert, he asked everyone in the audience to sing along to "Just The Way You Are" just for his pride and ego pleasure. Of course, a guy like Bruno will always gets what he wants. With a voice to die for and his mad James Brown dancing skills, women that night both young and old, married and single were dying to be Mrs Mars. Lol! It's really hard to put into words for his performance but i managed to record snippets of most of the song he sang and compile it into a video so i'll let you be the judge. 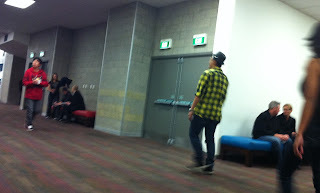 So my verdict for Bruno Mars: Doo Wops & Hooligans tour live in Auckland? In the words of Philip Lawrence (his backup vocalist) that night doing "The Lazy Song" it's a definite OH MY GOD, THIS IS GREAT! If you do have the opportunity to catch him live around your area, you definitely do not want to miss out on it. He'll have you strip down naked. That's how good he is. Lol! I'm fan of bruno mars I read some article about Bruno and I want to share it you the title was Bruno mars in zoot suits.